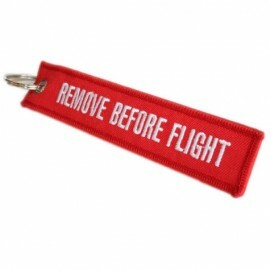 Remove Before Flight Keyring - spacekids - space toys, dressing up costumes, kids spacesuits, astronaut food, cool space stuff! Bearing the legend famous from Aviation - similar, if much larger tags are sometimes seen on jet engine covers - "Remove before flight" is embroidered on a fabric tag 13 cm long by 3cm wide. A really distinctive keyring or an excellent way to make your luggage immediately identifiable. No suitable for children under 3 years.